Especially during the Easter season eggs are consumed in masses. Therefore we want to give you a few tips and tricks about eggs in our Easter series, with which you and your children will certainly have fun. Today we will show you how to make egg heads with herbal hairstyles. Thus you have a beautiful decoration for the breakfast table, which is not only pretty but also useful. Egg shells: at least half eggshells, but the more the egg is in time, the better. additional material: glue, coloured paper, black sharpie, wobbly eyes etc. Take one eggshell and one cotton pad each. Now moisten the cotton pad and carefully place it in the eggshell. Then sprinkle some cress seeds on the cotton wool. 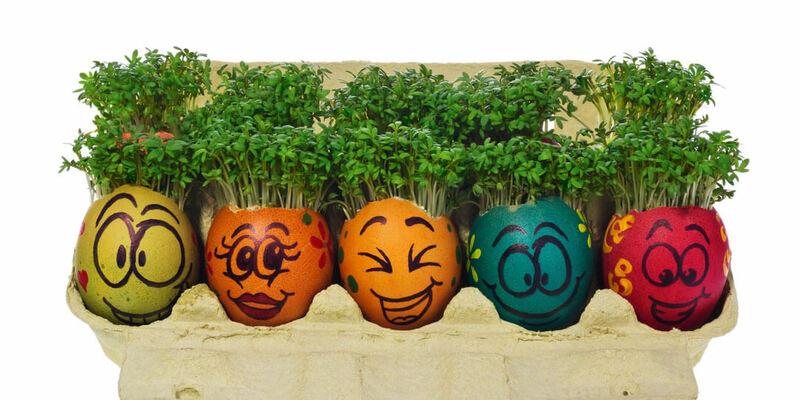 The sowing is now done and in a few days, you will be able to enjoy the flowering cress in the egg shells. After we have already taken care of the future hair of our eggheads, now comes the funny part: We create characters. Paint eyes and a mouth on the egg as you like. Here we have some mouths and eyes for you to print out. Simply combine wildly around to create the craziest egg heads. Especially good are funny wobbly eyes that you can stick on the eggs. Scars or painted cracks in the shell are just two of the countless decoration possibilities. As you can see, there are no limits to your imagination. After we have finished our handicrafts, our eggheads need a place where we can present them. Egg cups are particularly suitable for this. If necessary, we can also use a strip of paper about 1.5cm thick and 10cm long, which you glue together to form a ring and place the egg on top (but even a bottle cap will do the job). The bottom side of an egg carton is also excellent for a nest. Cut green paper into small pieces and put them in the egg carton. Now you can bed the herb heads on the paper grass. If the egg remains at the bottom of the glass, it is still fresh and can be eaten safely. The egg straightens a bit: Liquid has already evaporated from the egg. Consume the egg as soon as possible.